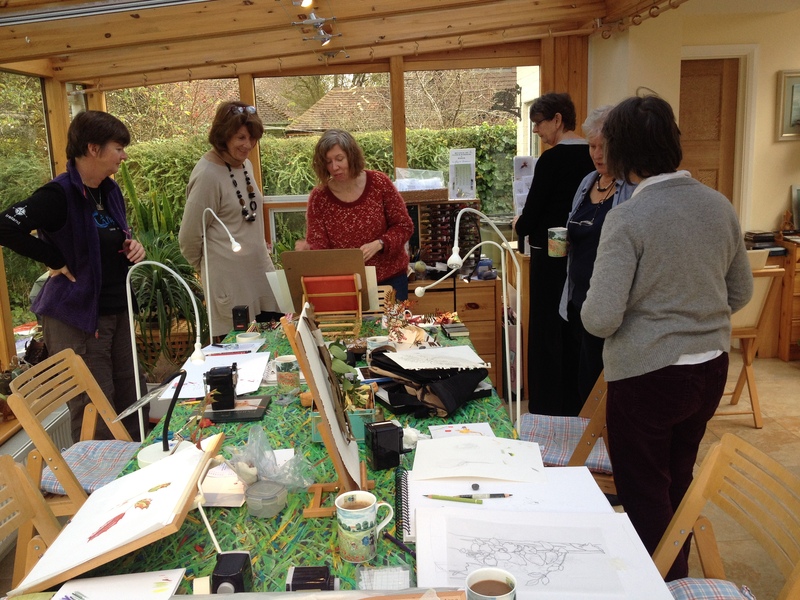 I have had a very good day in teaching this workshop. I mentioned yesterday that I had the feeling that there would be some lovely results from the workshop; that feeling persists. Even so, their accomplishments continue to amaze me and therefore I also need to be on my toes and give enough advice for continued development. I was glad to see that they took a couple of active breaks whilst drinking their tea or coffee, so that they could go back to the drawing board with fresh eyes. But, even though taking a break they continued to discuss their progress. Some of the work as it is developing. There is a huge difference in each of their styles of working and every student has a struggle with a certain aspect of their picture. 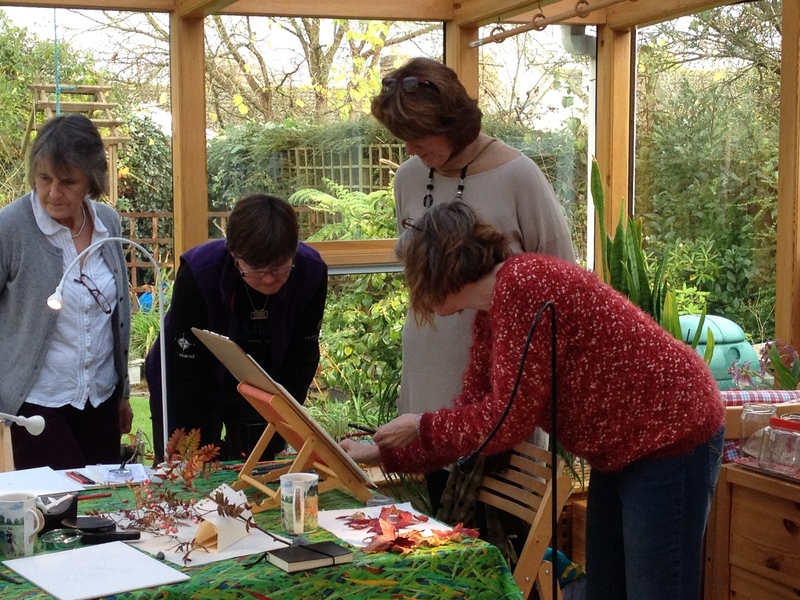 Two of the pictures were started on Monday at the SFP workshop, but you can see how their pictures are developing. 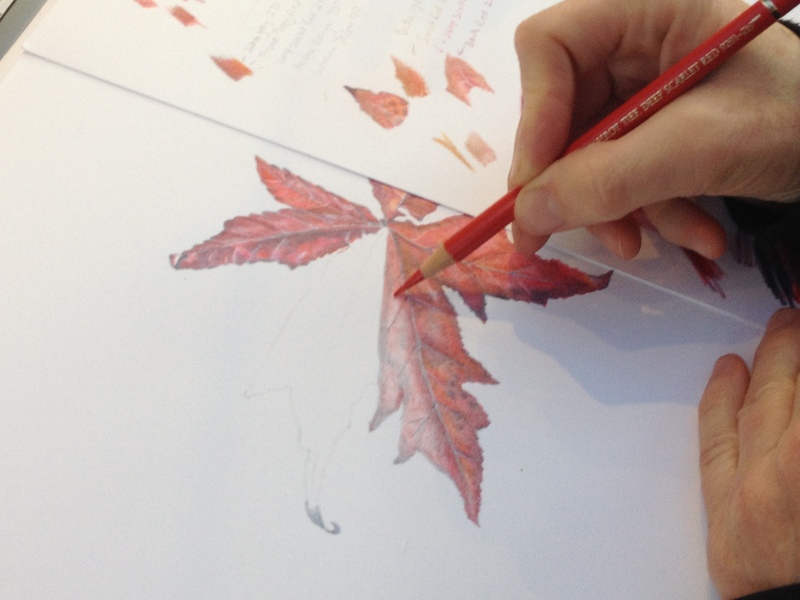 Some have chosen very complicated pieces to draw and in fact only started using coloured pencil this morning. Not all of the pictures are shown here. The last one shown below is the Honeysuckle. I think you might be able to understand the quandary the artist has when painting this picture. We are now in mid November, she has found this Honeysuckle still flowering, but knows that its days are numbered. In addition to the limited supply, she also wants to get done that part of the plant that is likely to die first – the flowers. 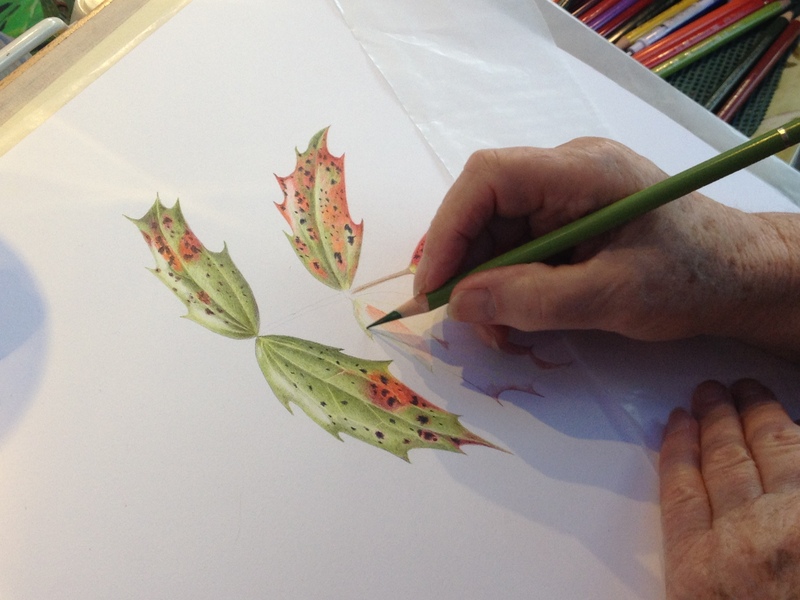 This is typical of all botanical art painted from a live subject – what do you paint first and what is likely to change most? In addition to this, if choosing to paint the flowers first, how much shading does one put into the flowers? 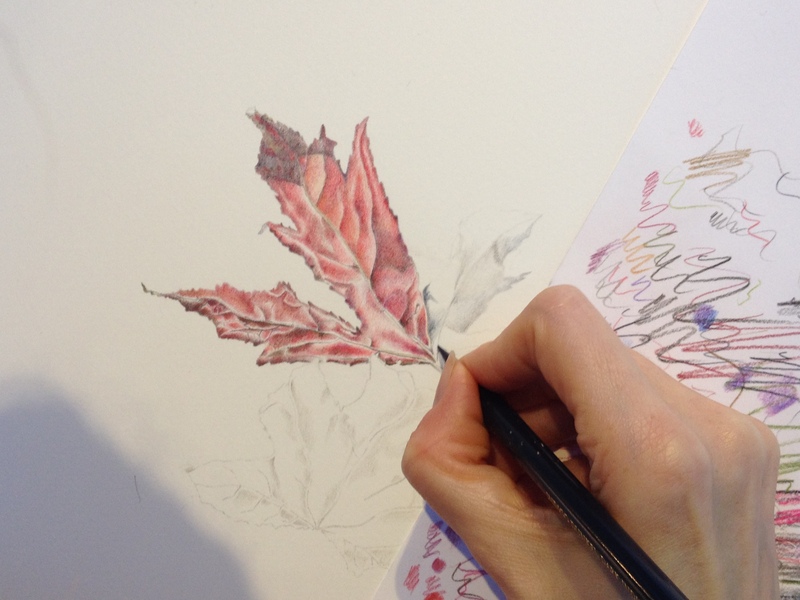 If the dark leaves are done first, then the ‘hole’ left in the picture for the flowers is likely to need much less shading than if done without a dark background. Painting white or very pale flowers on white is quite daunting. It is possible, but one has to make sure that the shading to create form, is not overdone. The problem is minimised if the pale flowers are against a dark background, or background of leaves. The hole you leave in the painting for the flower is a shape and therefore the problems of creating the appearance of three-dimensional form are reduced. The form of a subject is created by light hitting the surface of the subject. Some areas will be exposed to light and some areas less exposed to light or very little light. Thus the combination of the flat shape of the object, and the tonal differences created by light exposure, give you form; and a means of identifying the object. Colour is another issue altogether. 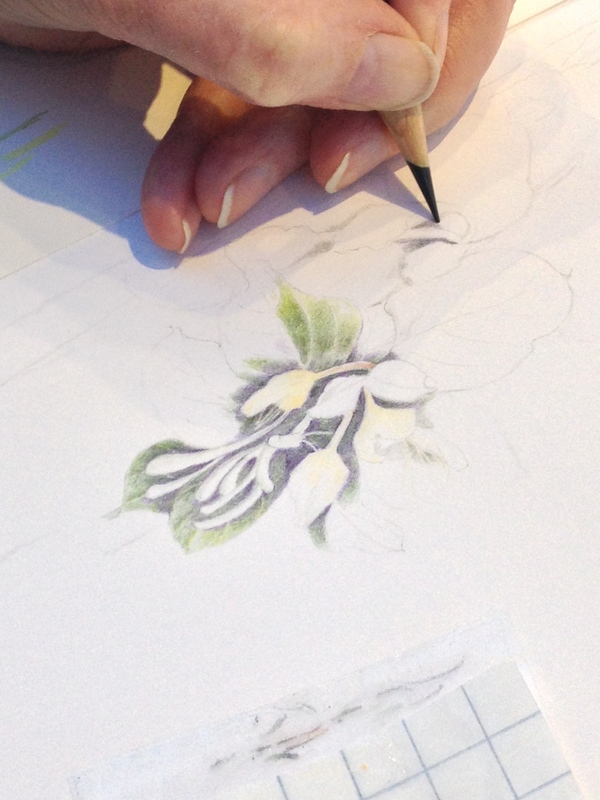 In the case of this Honeysuckle, it was decided that a grey underpainting on the leaves would be done first so that the flowers would stand out as white shapes. 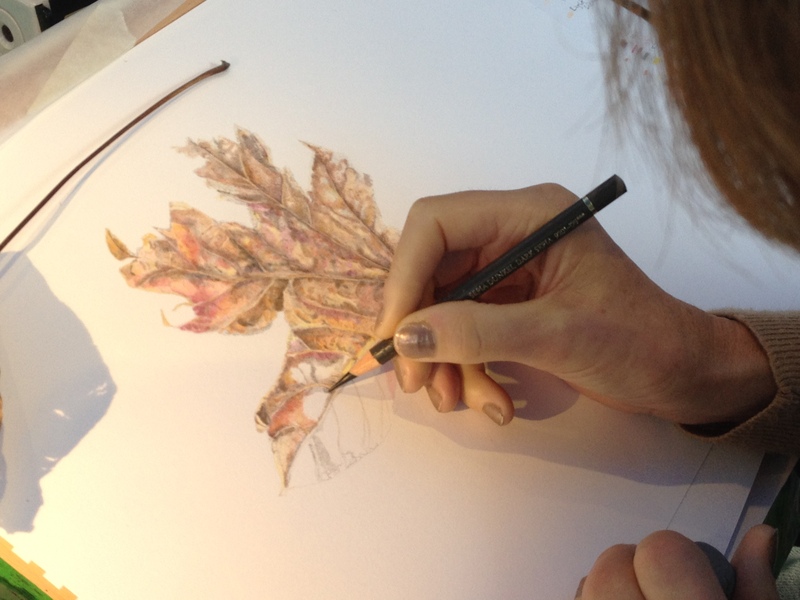 Before the leaves are completed fully, the flowers will be completed delicately and the leaves finished afterwards. The bark will be finished last of all but I doubt that you will get to see that part of the picture. Honeysuckle attached to Eucalyptus bark. So, some more pictures from the Botanical art exhibition held in Palmengarten the botanical gardens, Frankfurt, Germany.